Build professional company newsletters, brochures and long annual reports using Adobe InDesign CC. 76 lectures 5+ hours of well structured content. You’ll learn to design a flyer, newsletter, brochure, annual report & business cards. Learn how to create PDF files ready for printing. You will get the finished files so you never fall behind. Downloadable exercise files & cheat sheet. Forum support from me and the rest of the BYOL crew. Techniques used by professional graphic designers. A wealth of other resources and websites to help your new career path. You will need a copy of Adobe InDesign CC 2018 or above. A free trial can be downloaded from Adobe. No previous design skills are needed. No previous InDesign skills are needed. Hi there, my name is Dan. I am a graphic designer and Adobe Certified Instructor (ACI) for Adobe InDesign CC. In this course I supply exercise files so you can play along. I will also save my files as I go through each video so that you can compare yours to mine – handy if something goes wrong. Know that I will be around to help – if you get lost you can drop a post on the video ‘Questions and Answers’ below each video and I’ll be sure to get back to you. I will share every design trick I have learnt in the last 15 years of designing. 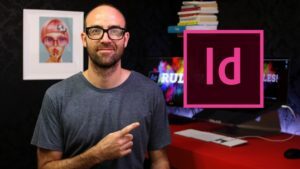 My goal is for you to finish this course with all the necessary skills to start making beautiful documents using Adobe InDesign CC. No previous InDesign experience is necessary. This course is for people completely new to InDesign. No previous design or publishing experienced is necessary. This is a relaxed, well paced introduction that will enable you to produce most common publications. Only basic computing skills are necessary – If you can send emails and surf the internet then you will cope well with our course.